Dog Gone Problems founder David Codr had a bit of a rough start with man’s best friend. As a young child, David was always fascinated by how animals communicated and interacted with one another. As he spent more time with them, David discovered he had a natural gift for relating to animals, training his family and neighbor dogs instinctively without any formal training. But it was a dog attack at a young age that would eventually lead him to his career as a Dog Behaviorist. Seven-year-old David was spending the weekend on his Uncle’s farm in Dwight Nebraska when he was attacked by their 100 pound German Shepherd, Kojak. David ended up needing over 500 stitches and a number of reconstructive surgeries after the attack to repair the damage. A few years later, David stumbled across a veterinary book on Animal behavior. He read through the entire chapter on Canines in one sitting and was applying this newfound knowledge shortly after; stopping a neighbor’s giant Schnauzer who loved playing with the family’s children and their friends by literally running them over. From that point on, David started to read books on dog behavior and training and continued to help family friends and neighbors with dog problems until he went to college. David spent the next 20+ years chasing a career in the music industry as a band manager, concert promoter and publisher. It wasn’t until he hit a rough patch that dog behavior resurfaced as a career option. One day when everything seemed to hit a low point all at once, David headed out for a walk with his Dalmatian Farley to clear his head. On this walk, he ran into a woman who’s two dogs were trying to fight the other dogs in the park, each other and their owner. After putting Farley into a stay a few feet away, he headed over to help the woman. A couple minutes later, the dogs were completely calm and the woman asked how much he charged. When David explained that he wasn’t a dog trainer, she replied that it was a shame as she had spent over two thousand dollars on trainers but none of them were able to stop the problems David ended in a couple of minutes. As he walked away, she said he was wasting a gift. After thinking about her comment on the walk back home, David put up an ad on Craigslist for dog help which led to his first paid client the next day. That session went so well the client recommended David to a friend which led to a series of referrals. A year later David was spending his days chasing his music career during the day and fixing dog problems at night. David ended up signing over his ownership in the music business company about a year later to focus on Dog Behavior full time. He resumed reading books on dog behavior and after a few years became an accredited Dog Behaviorist. David has now rehabilitated thousands of dogs with all kinds of behavior problems. After a few years of fixing dog problems in the Omaha area, requests for help started to come in from other parts of the country. Today David now travels to Los Angeles every few weeks to work with dogs there and flies to different cities when he receives requests for help. One of the things David’s clients like the most is the fact that he is able to solve most problems in only one visit. “I use positive reinforcement, Dog Psychology and many of the same communication methods dogs use with one another. That is how Im able to help most dogs so quickly” he explains. Obviously there are some dogs with real psychological issues (abused dogs, fearful, scared, etc) who need follow up sessions. But about 99% of the time, one session is all he needs as he teaches people what they did to confuse their dog. 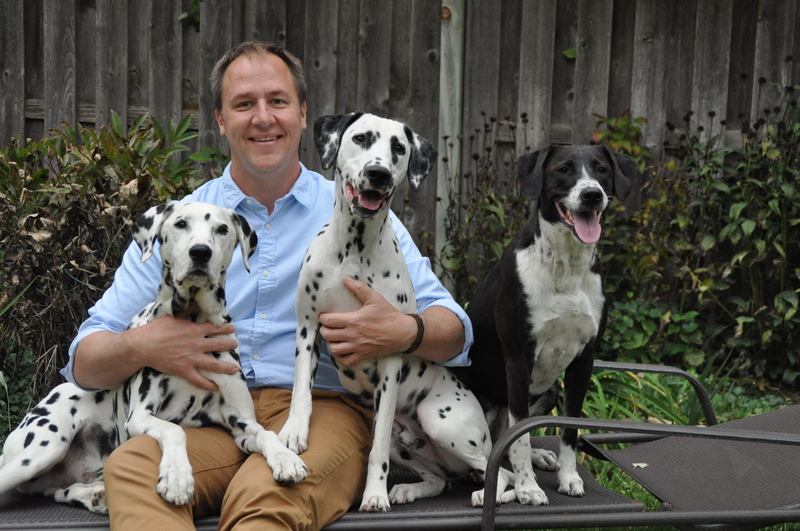 In addition to helping humans and their canine companions in person, he writes a weekly Dog Behavior Column for the Omaha World-Herald, gives free Dog Behavior workshops around the country and is always looking for talented people to add to the Dog Gone Problems team.